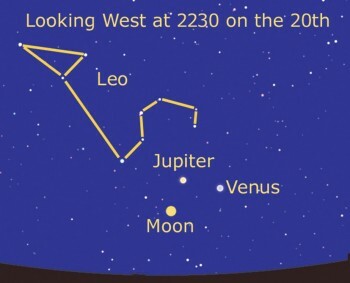 If you were looking at the evening skies last month, you would have seen the last of the winter constellations, Gemini, disappear into the sunset – but that brightest of planets, Venus, defy the westward drift of the sky to remain in the southwest. Well, it carries on behaving exactly the same way this month so, with Jupiter looming to the left, can you guess what will happen? I suggest you keep watching these planets as they make their closest approach, certainly in the six years I have been compiling these little bits of nonsense. It all happens on the last day of the month, which, with the Solstice on the 21st, means that it will still be quite light until after they set at around 11.30pm. So, you will need to be observing as soon as the Sun sets at half nine. Fortunately, Venus and Jupiter are very bright indeed, so they should be easy to spot in the glow of the sunset. Over on the other side of the sky and at the other end of the month, on the 2nd, the Moon provides another, more enigmatic show. This is the day of the full Moon and at this time of year, when the Sun is highest in the sky, the line the moon and the planets trace across the sky – the Ecliptic – is at its lowest during the night. This means that the Moon never rises very high and because of this, it looks huge. Look for it appearing over the horizon just after the Sun has disappeared, or preferably an hour or so later. It really does look a different Moon to the small one that shone with that silvery light high in the skies of December. There are many theories for this optical illusion but can you work out exactly what is going on? And, why is there no Moonrise on the 6th? While you’re puzzling over this, look to the right of the Moon and there is that other spectacular planet, Saturn. The twilight and the bright Moon will be drowning out a lot of the sky but Saturn should shine through and, of course, get better as the month progresses. I always think that the pairing of the Moon and planets make a beautiful sight and with a sky full of planets (Mars and Mercury are holidaying round the other side of the Sun this month) we are in for a few treats. First, a fairly thin crescent Moon sits near to Venus on the 19th, followed by Jupiter on the 20th. On the 28th, it’s time to visit Saturn before clearing the decks for the 30th. So, there you have it – plenty to see even during the month when it never gets dark!